Nezam Juman stands in the yard of his new house, which he's getting ready to remodel. The area grew steadily into a tourism and retirement destination, presenting a more affordable route to palm trees and white sand beaches than the state's more crowded eastern coast. Lee County's population of 23,404 in 1950 rose to 440,910 in 2000 — and since then has ballooned by another 67%. During the crisis, housing development Lehigh Acres was riddled with hundreds of empty lots and abandoned homes. In the mid-2000s, that steady growth started to escalate — fueled by easy money. Everybody has a story from that time: The schoolteacher and firefighter couple who built a $600,000 custom home. The handyman who was buying and flipping homes on the side. The happy hours where everyone seemed to introduce themselves as mortgage investors. Thousands of homes built on spec went unoccupied, driving their builders into bankruptcy. And thousands of homeowners whose livelihoods depended on the real estate industry, either directly or indirectly, could no longer make their payments — banks were rarely willing to modify their loans to help borrowers keep their homes. As the credit markets started to unfreeze in 2013 and 2014, the big home builders that survived the crash started buying stalled developments. Opportunists with loose cash — from local entrepreneurs to massive private equity investors, like Blackstone and Colony Starwood — snapped up thousands of properties. With so many cheap, properties to choose from, entrepreneurial real estate agents started offering tours of foreclosed homes. Besides professional services and back-office operations for large companies, Lee County has even attracted some light manufacturing, a comparative rarity for South Florida. A local glass contractor, MyShowerDoor.com, is building a $7 million factory to make office partitions and bulletproof glass for schools upgrading their security. 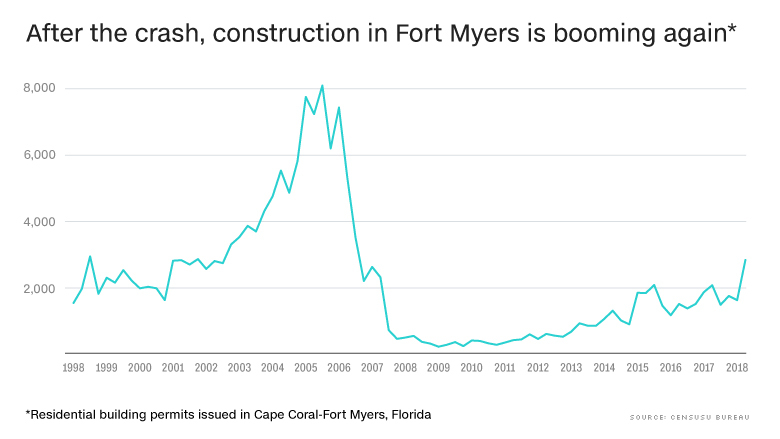 Meanwhile, the main roads through Lehigh and Cape Coral are dotted with bright flags advertising new model homes, with sometimes as little as zero dollars down — eerily reminiscent of the pre-crash frenzy. The endless blocks of still-scattershot development are being filled in again by contractors putting up cookie-cutter houses. 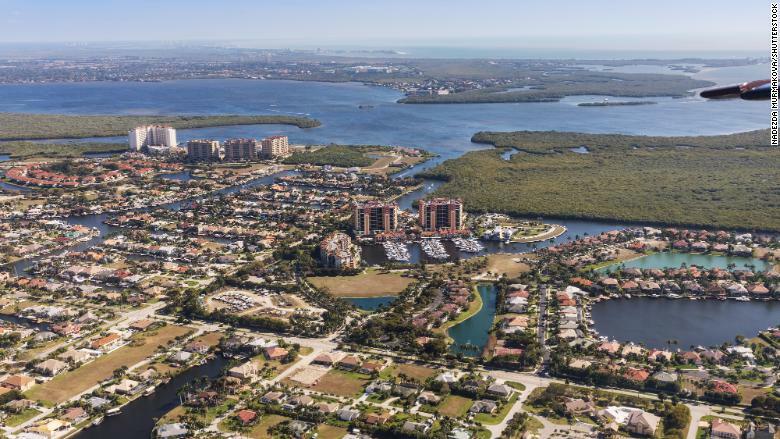 An aerial view of Cape Coral, Florida. 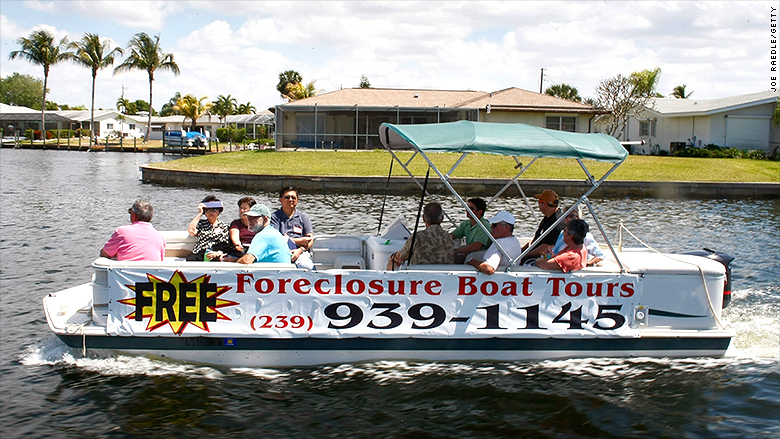 Fort Myers realtor Marc Joseph has seen hundreds of properties go through foreclosure and then appreciate rapidly. Correction: A previous version of this story misstated the cost of the factory that local glass contractor, MyShowerDoor.com, is building.